Making huge, complex builds has been a staple of Minecraft forever. I don't know about you, but for me, one of the hardest parts of a large build has always been planning - knowing exactly where you're going to build, how large it will be, and where everything will go. For people like us, there is now a really sweet mod, called "Schematica", created by Lunatrius! 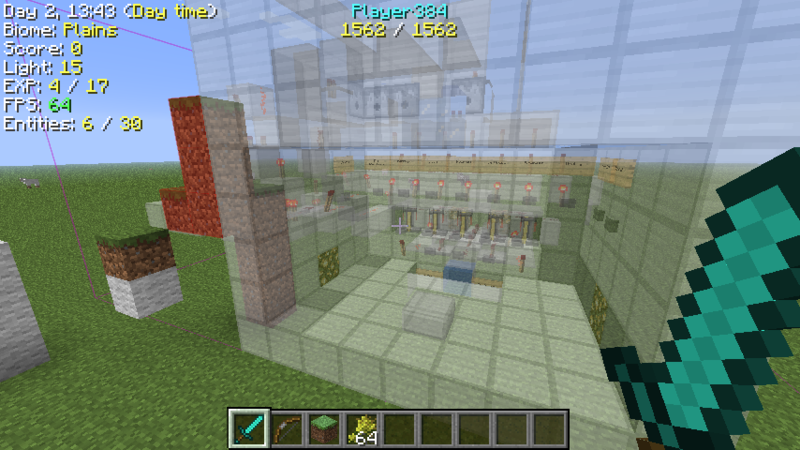 With this mod, you are able to display a ghost image of a schematic file inside Minecraft to rebuild a structure, or export any part of your world (or a server's world) into a schematic file. You're able to export parts of your world, too! Gone are the days of random builds, using MS Paint to plan, or spending hours on a build, only to discover you were ONE BLOCK OFF. Take note: this mod requires Forge, as well as another mod made by Lunatrius, which serves as a hub for all of his mods. Man, this like MCEdit but with more work required! On a more serious note, this is really useful for servers! I'll probably use it if I get the chance to. So it works client-side on servers? Sounds very useful indeed. Yeah, boyeeeee! I'm glad to see a talented modder like Lunatrius finally getting some recognition! When I saw the news in my RSS reader before going to bed... I was just like "O_O". I sure was. Lunatrius, this will be great! I'm totally going to be running workshops, teaching all of my crazily creative kids how to use this once it's in release. but, hum .. maybe it will be so much easier to use than MCEdit, that I won't have to? Love it! I'm rather fond of this mod. Though it can have issues working with other mods. This is nice, but I won't use it. hey i have this problem where i cant see no blocks all i can see is clouds the sky and the sun but when i walk there is the outline of the block i cant deal with this i have been all over the internet looking if anyone has the same problem but i cant find any HELP!!!!!!!!! Could've asked about it in the thread. Just head over there and list other mods that you might have installed alongside Schematica. I'll help anyone, but with enough information (otherwise I can take guesses what's wrong ;)). I can't download it. click the "Skip Ad" button but it just brings me back to the same adfly page. Moving on up in the World (of Minecraft), Lunatrius! Good to see some mods being checked out as a featured community creation. Keep up the wonderful work, man. whats the mod he is using that shows the thingy like debg screen??? uhmmm I thought this has been out for weeks now or was there a different mod by the same name that did the same exact thing? It was out for about a year and a half. Was really surprised to see it spotlighted after such a long time, my jaw just dropped at first (literally! ).